The LCD-80 is an 80-character, backlit LCD display annunciator for the NOTIFIER AFP-2800 and AFP-2802 fire indicator panels (FIP). Up to 32 LCD-80s may be connected onto the two-wire distributed ring. 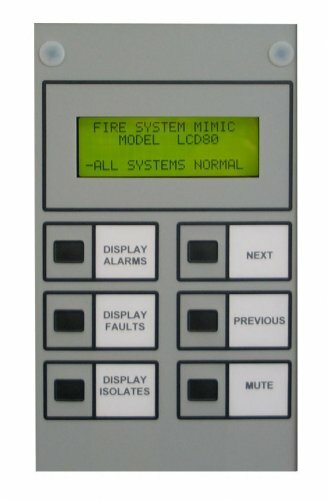 The LCD-80 has two basic modes of operation, “Terminal” and “Annunciator” mode. 80-character backlit Liquid Crystal Display (20 characters x 4 lines). Time and date display field. Can be remotely located up to 1000 metres from the control panel. Mutable local piezo sounder with alarm/fault/isolate resound. Flush or surface mount options available. EIA-485 interface: up to 32 per FIP.